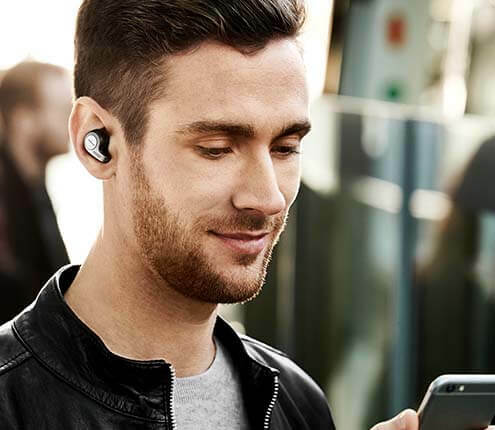 Whether you’re jogging or working out at the gym, our cordless earbuds stay snugly in your ears while you’re in motion - ensuring you won’t miss a beat. Now with a battery that delivers 4.5 hours of play time, coupled with a portable charging case our wireless in-ear headphones give you 13.5 hours of power at your disposal. Superior comfort and an always-reliable secure fit is delivered by customizable fitting options that enable all-day use and improve the quality of your sound experience. Our sport earbuds a secure fit no matter how vigorous your workout is, and you have the option to wear one or both buds depending on your activity. Whether you’re a seasoned athlete or just trying to get fitter, you can train smarter, not harder, with Jabra Elite Sport and our integrated fitness app, Jabra Sport Life. The in-ear precision heart rate monitor works with the app to track and analyze your fitness as well as provide personalized audio coaching in real-time during your workout. You focus on the exercise, and we’ll focus on the counting. Our Automatic Rep Count feature tracks your movement via sensors in our earbuds, gives you a countdown on your smartphone’s screen, and provides feedback via in-ear notifications. On your screen you can also watch videos highlighting the correct way to perform an exercise. 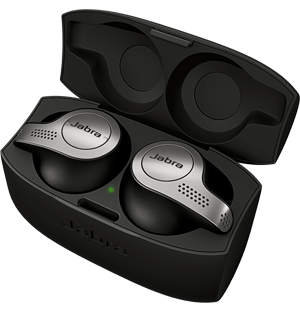 Jabra Elite Sport cordless earbuds are waterproof and come with a 3-year warranty against sweat damage (registration required). In our testing they didn't once feel like they might fall out, even when rigorously shaken. ***3 year limited warranty against defects from the effects of perspiration. Requires registration through Jabra Sport Life application with headphones connected.